Stacie G., 45, of DePaul’s Neighborhood of the Arts (NOTA) Treatment Apartments, has always had a soft spot for animals. Growing up in Williamson, New York, Stacie had the typical cats and dogs, and a few atypical pets including a chicken and a chinchilla. As an adult living at a DePaul residence in Spencerport, Stacie began volunteering her time with The Reptile Guys shop which was located nearby. That’s where she fell in love with bearded dragons and even snakes. Stacie moved from Spencerport into DePaul’s NOTA apartments in Rochester, New York several years ago. 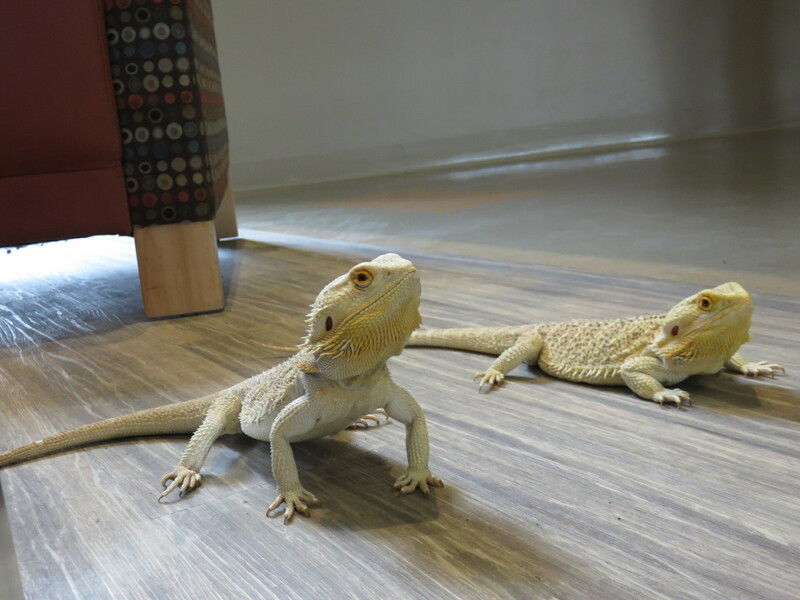 She still volunteers with The Reptile Guys when able, but back at home, she’s got her hands full with two bearded dragons of her own – Sidney and Saxton. Her first dragon was Sidney. She got him two years ago when he was eight months old. She added Saxton about a year ago. 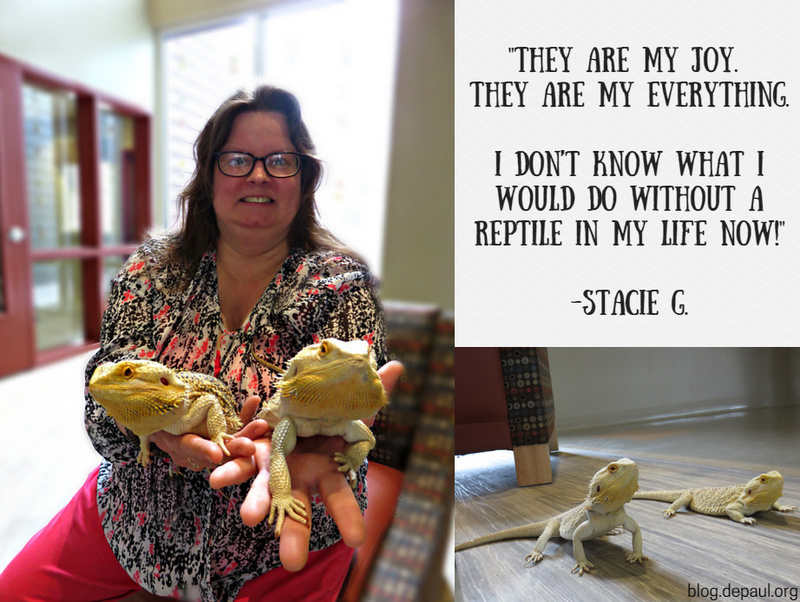 For Stacie, her lizards are just as good, if not better than a dog or cat. She gives them kisses on their heads and brings them places in a carrying case which they begrudgingly share. They actually do have personalities, Stacie said. “They don’t get along well, but once and a while, they snuggle,” she said. They don’t share a cage. Bearded dragons eat vegetables, super worms, and crickets. Stacie feeds them two times a day. She houses them in tanks with sand and a special UV lamp that keeps them at an ideal temperature of 68 to 75 degrees. She bathes them twice a week to help them retain moisture as they don’t get enough through the greens which they eat. When the dragons are mad, she said, their chins will puff up and turn black. If they get real mad, their tails will even turn black. Bearded dragons can live for up to 10 to 12 years, according to Stacie. Residential Counselor II Grace Joseph said Stacie goes above and beyond to ensure the well-being of her bearded dragons, feeding them an organic diet and ensuring they receive an acceptable amount of natural sunlight. She provides them each with an equal amount of attention and recognizes when they need time to themselves. Stacie is not only learning a lot about reptiles herself, she’s passing on that knowledge to others. She helped get The Reptile Guys into NOTA for a show and she brings Sidney and Saxton out for events such as the Valentine’s Day dance in February. She also has friends who stop by her apartment just to visit the dragons.